Ruth Morrissey has been told her cancer will progress to terminal within a year. 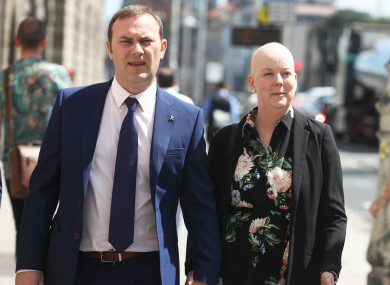 Ruth Morrissey's lawyers argue that failures to correctly report previous smear tests resulted in devastating consequences for the Morrissey family. THE CASE OF a woman who is suing the State and two laboratories over two incorrectly read smear tests today heard that her tumour has reduced and her doctors are planning a course of radical radiotherapy. Ruth Morrissey who lives on Schoolhouse Road, Monaleen in Co Limerick, has said smear tests carried out in 2009 and 2012 were wrongly reported as normal. She and her husband Paul, who have a seven-year-old daughter, are taking a High Court case against the HSE, US-based lab Quest Diagnostics and Irish firm Medlab Pathology. The court previously heard that the 37-year-old had been told that her cancer would progress to terminal within a year. Her lawyers argue that failures to correctly report previous smear tests resulted in devastating consequences for the Morrissey family. Today Mr Justice Kevin Cross heard details of reports from a number of doctors, including Ruth Morrissey’s treating oncologist. He reported that her pelvic mass had reduced and that there is no evidence of disease elsewhere. Her tumour is inoperable and the plan now is to proceed with a course of radical radiotherapy and to get CT scans in three months’ time. The judge said the situation is “more hopeful” from Morrissey’s point of view than earlier reports on which the application for speedy trial were based. Legal counsel for the Morrissey family requested that the case continue to be heard in August, pointing out the risks identified by doctors in relation to Ruth Morrissey’s treatment. They also said their client requires funds for her care and to make moderations to her home now. Barristers for the two laboratories argued that the case should be adjourned until scans are available after the three months of radiotherapy. However Mr Justice Cross said this would be “unfair” on Morrissey. He adjourned the case until 18 September. Last week the State Claims Agency (SCA) said it wanted to resolve the case through mediation and that it had written to the laboratories to try to resolve the matter out of court. Responding to this statement from the SCA, the Morrissey family’s solicitor Cian O’Carroll said the State had rejected several offers of mediation in the weeks leading up to the trial. He said the SCA’s agreement to do so last week forms part of a press release to suit its own purposes. He accused the agency of aiming to give “an altogether different impression to the general public of their role in this shameful case to date”. Taoiseach Leo Varadkar and Minister for Health Simon Harris are now both under pressure to explain why women affected by the Cervical Check scandal are still ending up in court after they made assurances this would not continue to happen. Comments are closed as proceedings in this case are ongoing. Email “Ruth Morrissey's situation 'more hopeful' as doctors plan course of radical radiotherapy ”. Feedback on “Ruth Morrissey's situation 'more hopeful' as doctors plan course of radical radiotherapy ”.